Conditions were terrific last Thursday for a fishing trip to the land cut. Not a cloud in the ski and a nice breeze to keep it cool. The winds were coming from the Southeast making the water current just right. Fishing was bound to be good. This trip I had the pleasure of going out with a great friend and his boy's. 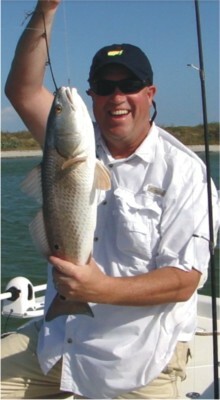 Armed with live shrimp we cast our hooks in the water near the shoreline and Travis hooked up a nice 28 1/2 inch redfish. Very nice struggle as the redfish took Travis around the boat before finally landing this bull. He was just barely outside the slot so we released her help keep the estuary in good stock. This was a new Texas JustGoFishin Trips Record. Very interesting day as we caught several different kinds of species, redfish, speckled trout, sheepshead, and sand trout on the edible side. 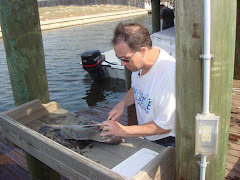 We also caught your usual hard head, skip jack, dog fish, and an occasional blue crab refusing to let go of bait. I wonder witch is the hard head? (catfish or crab). Anyway the fish we caught were all made in about 90 minutes as we ran out of bait. Sorry, my bad... rookie mistake. We would have easily caught much more on this day! ﻿Just great fishing with an awesome family... from left to right in pic above: Joshua, David, Travis, and Bryan.